A grandfather tells his grandchildren a bedtime story about a land called Chewandswallow where the weather rains soup and sunsets are made of jello. Life is grand until the wrath of mother nature is unleashed and the citizens of Chewandswallow are forced to flee their homeland. What began as the crazy musings of an old man quickly evolves into a harrowing tale of man vs. nature and of immigration and cultural assimilation (for a more detailed account, see the book below). Reader Beware: Cloudy With a Chance of Meatballs has some truly disturbing illustrations. Mixed in with the sometimes awe-inspiring artwork (I particularly liked the hamburger storm clouds), the details of the illustration reveal an artist with a mischievously warped mind. 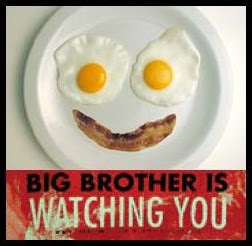 For example, there is the picture of a terrified bird returning to the nest only to find that it has been smothered by a fried egg. Think about the implications of that for a second. In another particularly disturbing illustration, a sanitation truck has, what can only be described as baby heads mounted on the front bumper. Once you start noticing these things, the illustrations (which are rich with quirky little details) becomes a Where's Waldo of the surreal and macabre. but TWO babies heads stuck to the front of the truck! What the?! In the name of all that is good and greasy, what the heck is going on here?! Do we simply write this off as strange off-beat humor.... or could there be more to this than just illustrative hijinks? Perhaps all was not well beneath the surface of this mythical Foodtopia. 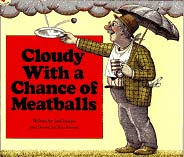 Is it possible that the fantastical story of Cloudy With a Chance of Meatballs is merely state-sanctioned revisionist propaganda and the illustrator is trying to send us a hidden message, cleverly embedding it in his illustrations? 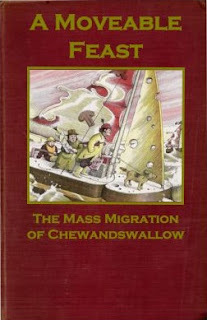 Could it be that the citizens of Chewandswallow were fleeing more than just bizarre weather patterns? Maybe the Sanitation Department was just one arm of a sadistic government beast and these brave souls were escaping from the confines of a brutal totalitarian regime? 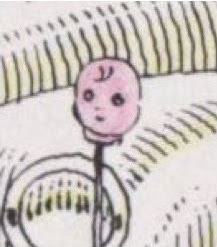 I think it is not meant to be the head of a baby - but a doll's head. I have noticed this since childhood wherever I have lived: garbage trucks mount stuffed animals and dolls on the fronts of their trucks. And it is always creepy, because they are discarded toys. It seems like some kind of ongoing sanitation dept. joke. This has been my absolute favorite children's book since I was about 5, giving it a good 20 year run. 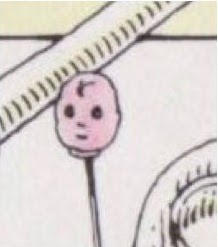 How have I never noticed baby heads????? brilliant. loved this book as a child- def. need to revisit it as an adult to check out these details! I illustrated this book. To clarify the heads: sanitation workers in New York City find dolls in the trash place the heads on the the rods at the front corners of their trucks which they use to navigate through tight spots. One can also see teddy bears on the radiator grills. What the reader sees is the work of playful garbagemen, not sadistic maniacs. It was extremely interesting for me to read this article. Thank author for it. I like such topics and everything that is connected to them. I would like to read a bit more on that blog soon. "Meditate on self, not TV"
That's in there. So are the names of great composers!! What else have you hidden? You are such a talented, amazing person! As a child I absolutely LOVED this book....it was real to me.